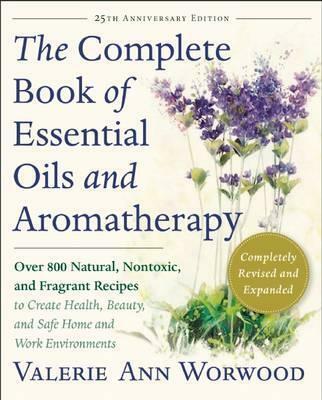 Looking for books on essential oils? Completely updated essential oils book: The Complete Book of Essential Oils and Aromatherapy might be the best aromatherapy book available anywhere. And, it just got better! If you liked Modern Essentials, you'll love this essential oils favorite: The Complete Book of Essential Oils and Aromatherapy, Revised and Expanded is a necessary resource for anyone interested in alternative approaches to healing and lifestyle. This new edition contains more than 800 easy-to-follow recipes for essential oil treatments from Valerie Ann Worwood, a consultant and expert on the clinical uses of essential oils internationally. Explore the multitude of benefits of essential oils and aromatherapy: In her clear and positive voice, Worwood provides tools to address a variety of health issues, including specific advice for children, women, men, and seniors. This aromatheraphy book also covers self-defense against microbes and contaminants, emotional challenges, care for the home and workplace, and applications for athletes, dancers, travelers, cooks, gardeners, and animal lovers. Worwood also offers us her expertise in the use of essential oils in beauty and spa treatments, plus profiles of 125 essential oils, 37 carrier oils, and more. An essential oils book classic for 25 years: Since the publication of the first edition of this book 25 years ago, the positive impact of essential oil use has become increasingly recognized, as scientific researchers throughout the world have explored essential oils and their constituents for their unique properties and uses. "The bulk of the book is devoted to how to use essential oils for healing and wellness. There are specific recipes and instructions for everything from work stress to head lice to spa treatments to applications for pets. It's a perfect addition to every home library." "Impressively thorough, well organized, and with a clear table of contents, Worwood's book is easily navigable to find information symptom by symptom, oil by oil, or topic by topic (such as workplace or travel). . . . Worwood's tone is positive and pragmatic. With benefits for whole-body health, home, and beauty, the promise of essential oils seems too good to be true, but Worwood's research, experience, and diligent instruction, along with her calm voice, prove the might of natural oils." Valerie Ann Worwood has a doctorate in complementary health and is a clinical aromatherapist who teaches throughout the world training therapists and medical practitioners. Her books include The Fragrant Mind, The Complete Book of Essential Oils and Aromatherapy, Aromatherapy for the Healthy Child, Endometriosis Natural Treatment Program (with Julia Stonehouse) and Aromatherapy for the Soul.